Midway Motel Oamaru is located close to Oamaru city centre – about 2 minute walk away. As such, it is within easy reach to most of the main attractions in town like the historic area, the blue penguin colony and Oamaru’s museum. Don’t simply eat at the Chinese restaurant opposite, just go into town and enjoy delicious food in one of the good Oamaru restaurants. 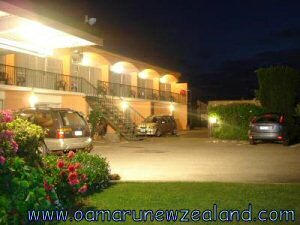 As with all good motels you will find when you travel to New Zealand : all the rooms come with TV and telephone, irons and ironing boards, wireless internet and laundry facilities are available as well. This is a very good yet cheap motel: the room rates at the Midway motel Oamaru are from NZD95 to 130 (for 2 persons) and this include GST. All major credit cards are accepted for your easy New Zealand vacation experience. a one-bedroom unit with 2 queen beds and 2 single beds (oven and microwave).